takes special care to avoid the exposed root around #’s 19 and 20. Recession. Last year, you prescribed fluoride trays to help relieve the sensitivity. You don’t know if they are using the trays, however, because you can’t recall the last time you authorized a refill on the gel. The exposed root causes the patient to jump out of the chair at the slightest contact with room temperature irrigation water or (gasp!) the scaler. You come in for your exam and note gum recession, which has deepened by .5mm since last year. There’s no active periodontal disease or infection, the recession seems to be caused by parafunctional habits. You consider prescribing a nightguard. “Let’s keep watching this area on the lower left here. You have a little bit of gum recession going on there. That’s why those teeth are so sensitive”. “Let’s keep watching this area on the lower left here. You have a little bit of gum recession going on there. That’s why those teeth are so sensitive”. You’ve been watching the recession for 2 years, but the gum tissue is never going to grow back. Your hygienist, kind as she is, laments having to be so careful around those teeth, which could really use some scaling, but your poor patient deals with pain and sensitivity on a daily basis. Why do you continue to “watch” this area? Would you “watch” the area if it was a small occlusal decay? 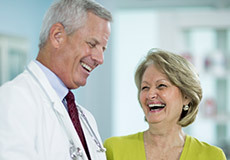 It’s no exaggeration that about half of all your patients have or will have some form of gum disease, and that figure jumps to 70% for patients over age 65. 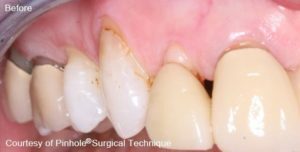 Are you “watching” gum recession in 50% of your patients, waiting for it to progress to a serious problem? What about 25% of your patients? Early intervention is the key to preventing tooth loss from recession. As time marches on, the alveolar bone continues to deteriorate, bringing the gum tissue down with it. Not only can correction of recession provide an aesthetic improvement, but it can also prevent further bone loss and eventual tooth loss. 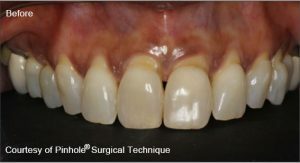 Combined with correcting the cause of the recession, state of the art techniques, such as the Chao Pinhole Surgical Technique are minimally invasive with no downtime. This treatment provides dramatic results that can help your patients keep their natural teeth longer, relieve sensitivity from exposed root surface, and improve appearance. For more advanced bone loss, grafting and regeneration of alveolar tissues may help reverse the damaging effects. Treating recession before it becomes a serious problem is key to maintaining strong, healthy teeth for a lifetime. Give Dr. Q a call, and let’s schedule a Lunch & Learn to provide you and your team with important tools to help do the right thing for more patients with recession. Welcome to VIPS Dental, Dr. Stephanie Trahan! We are proud and excited to announce that Dr. Trahan will be opening her mobile periodontal and surgery practice in South Carolina this summer. Dr. Trahan will be providing in-house periodontal, surgical, implant and IV sedation services to general dentists in the Charleston area. General dental practices in and around Charleston, SC will be able to expand the services offered in their practices by utilizing Dr. Trahan as an as-needed virtual associate. Dr. Stephanie L. Trahan is a general dentist with 5 years of experience providing periodontal and oral surgical treatment utilizing intravenous conscious sedation. 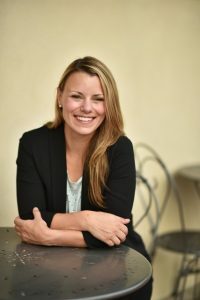 She has a military clinical training background, extensive international volunteer experience, and presented numerous continuing education courses. Dr. Trahan is originally from Vermont and graduated from Syracuse University with a Bachelor of Science, and Boston University Medical School with a Masters in Medical Sciences. She attended Boston University Henry M. Goldman School of Dental Medicine with a full scholarship from the United States Air Force; she also served as class president all 4 years. Upon graduation in 2011 she was accepted into a competitive surgical program at Lackland, AFB in conjunction with the University of Texas, Health Science Center San Antonio. Dr. Trahan was then assigned to Robins AFB, GA where she performed periodontal and oral surgery, IV conscious sedation, and general dentistry for the active duty population. 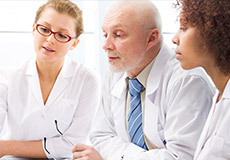 Dr. Trahan has taught several continuing education courses on surgical techniques and has won several awards for her presentations. Dr. Trahan spends much of her spare time coaching Special Olympics sailing and was named the GA state coach of the year in 2015. Dr. Trahan is also an active member in the volunteer group Dentistry for All, Guatemala and volunteers yearly to perform dentistry in disadvantaged communities. She has been recognized by the American Dental Association for her meritorious service to the people of Guatemala and is also a student mentor for Boston University’s international externship program. Dr. Trahan recently completed her Air Force active duty service commitment as a Major, and settled in beautiful Charleston, SC to enjoy the sailing, history, gardening, and friendly people. To learn more about keeping more treatment in-house and offering expanded services in your Charleston general dental practice, contact us. Dentists with strong surgical and sedation skills are finding that our non-traditional practice model restores their passion, improves their lifestyle, and increases profitability. Being a dentist can be really stressful, especially when you spend more time managing employees, dealing with dental insurance, working on accounting and juggling all the non-dental duties that go along with owning and running a successful dental practice. The average dentist spends only about 60% of their time performing dentistry, while the other 40% is spent on managerial and administrative tasks. (Dental Economics; vol. 95, issue 6; “Production Increase”). 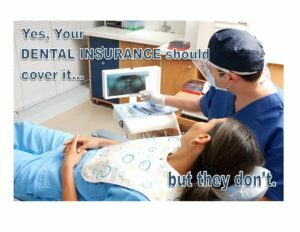 It is no wonder so many dentists feel stressed out, burned out and (gasp!) even tired of being a dentist.